● Schools and homes have to collaborate in raising and educating children. In addition to scientific articles on the topics of education and psychology, the journal also presented reviews of the First and Second Congresses on National Education convened in 1917. In 1917, six issues of the journal were published, three of which were double issues. The last double issue and also the first issue of 1918 were published in early 1930 due to the political situation in the country. 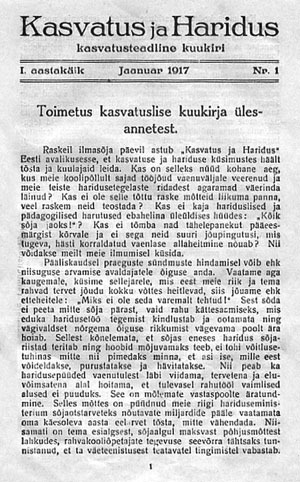 The first attempts of Estonian teachers to establish an association date back to the period of the awakening of national consciousness. 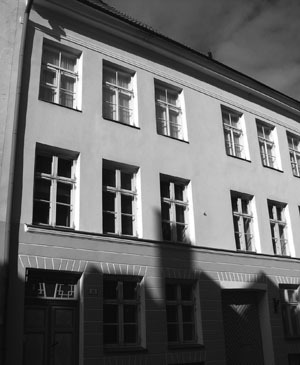 Although an independent teachers’ association was not yet established, the Society of Estonian Literati, founded in 1872, became the venue for teachers to meet. During the time of Russification the society was disbanded and teachers’ congresses were banned, as they were considered highly suspicious meetings by the authorities. Only after the Revolution of February 1917 were activities of that nature resumed. In March of that year, teachers’ associations were established in Tallinn and Tartu and shortly thereafter in other towns and districts. From April 7th to 9th, Peeter Põld and the Estonian Society for the Education of Youth organized the first Congress of National Education in Tartu. The idea of organizing a teachers’ union was presented at this congress. At a meeting in Rakvere on May 27th (May 14th according to the old calendar) the statute was confirmed and the Central Union of Estonian Schoolteachers was formally established. 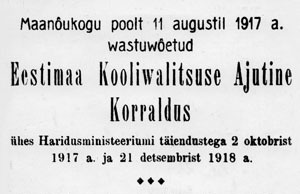 After 1919 it was called the Estonian Teachers’ Union. Peeter Põld was elected the first chairman of the Central Union of Estonian Schoolteachers. ● Schools were to be staffed by voluntary, well-trained teachers who were willing to participate in professional development. At the end of March, 1917, the Provisional Government of Russia decreed the union of the territory inhabited by Estonians into the Estonian “Gybernya”. At the end of May, elections to the Parliament (Maapäev) took place and a national government was formed. Estonia thereby gained virtual autonomy. ● educational inspections were to be separated from economic problems related to the operation of schools. All of the local community and district governments obtained broad rights to organize and manage their schools according to that decree. The Maapäev Department of Education (Ministry of Education) was tasked with providing the general leadership and management of national education. The above law was the basis for the organization of education and schools and was in force until 1940.